On 22nd November 2017 the Rt Rev’d Peter Burrows, Bishop of Doncaster, was having lunch in a cafe when his chaplain began a discussion about the case of Fr Matt Ineson. Fr Matt had been a priest at a parish less than a mile from the cafe. 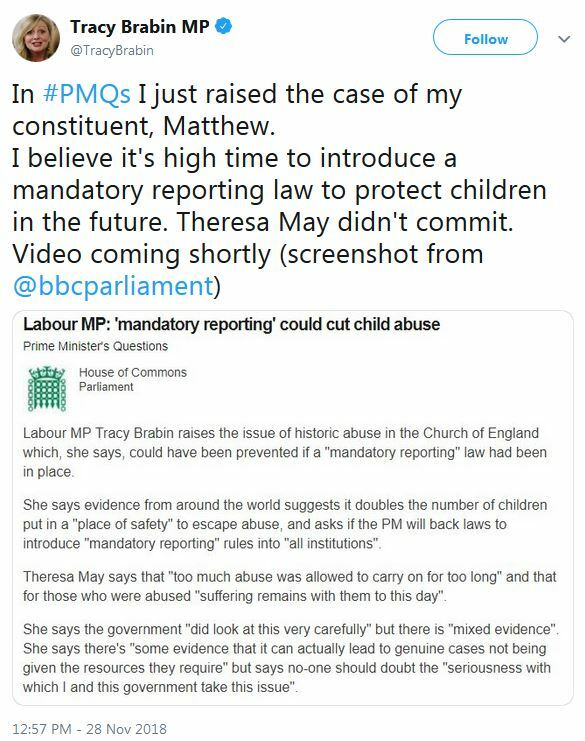 In 2016 he waived his right to anonymity and began to speak publicly of having been seriously sexually abused by the Rev’d Trevor Devamanikkam as a young person, many years before. He did so because he believed that this was the only way that the Church of England would properly engage with his case. It was not an easy decision for him. The remarks of Bishop Peter and his chaplain were so indiscreet that when they were overheard by a local funeral director known to Fr Matt, who happened to be in the cafe with his wife and had a better opinion of the victim of the church, he left the cafe and immediately relayed the conversation back to Fr Matt. Fr Matt has not had a happy experience following his disclosures. As is not uncommon, it had taken many years for him to find the personal resources to speak of his trauma. He did so, he says, by initially raising the matter with no fewer than four bishops and one archdeacon (now a bishop): he complains that none of them responded appropriately or offered him any support. The police did. They took him seriously, asked him to leave matters in their hands which he agreed to do, and notwithstanding a time delay of some 30 years from abuse to reporting, they investigated his complaint thoroughly, and when the file was presented to the Crown Prosecution Service, they in turn found that the case cleared the evidential ‘high bar’ needed to bring a prosecution after so many years, and did so. The Rev’d Trevor Devamanikkam killed himself on the day he was due in court. 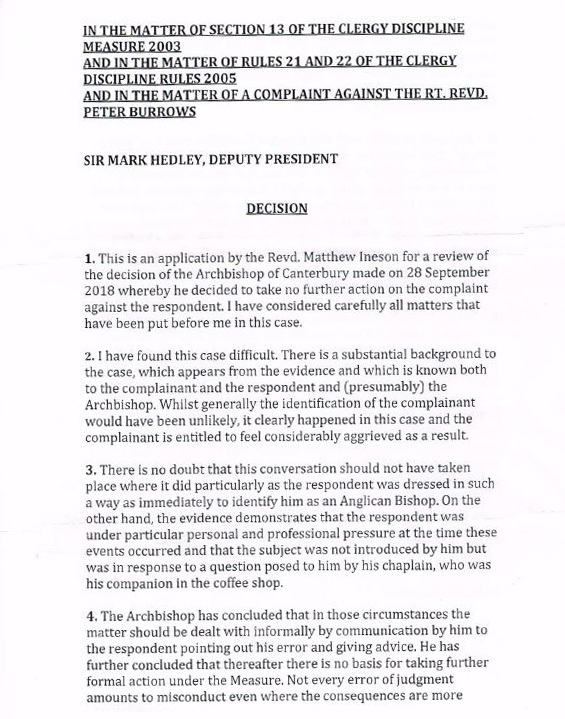 A civil claim was recently settled… with Devamanikkam’s estate: the Church of England refused to accept liability despite Fr Matt having been raped by a vicar in a vicarage. Fr Matt was told by the church’s National Safeguarding Team, which had taken responsibility for the civil case and victim care, that he would receive a formal apology after settlement. Three months later that has not been been given. Those who hear his story in depth are usually persuaded by his straightforward, uncompromising approach to addressing the issues, which he attributes to his Yorkshire upbringing. Fr Matt believed that the church should have been more supportive of him but, tellingly, he also says that it did not support his abuser Trevor Devamanikkam, who, it transpires, was known to have mental health difficulties and had attempted suicide before. In my very first conversation with Fr Matt, he told me that he had prayed for his abuser when he heard of the suicide, and has also remarked that nobody in the church has ever reached out and asked how he might be impacted by knowing that it was his disclosures which brought about the abuser’s death. Such conflicted survivor guilt is not uncommon. He believes that the Church of England and its structures failed him and his abuser on multiple levels, and even after the legal settlement he is still trying to help other victims and the institution he once served – to put itself on a more righteous path. Like many other victims, he speaks of an undermined faith arising not out of the primary abuse, but the response of the church to it. That is a serious charge, both now and on the Day of Judgment. The shepherds seem to fail the flock continually, especially the lambs who are left behind. When complaints were initiated via the Clergy Discipline Measure (CDM) against the five bishops accused of failure in various ways (and gradations of seriousness), every one of them availed himself of an immunity conferred under the Measure. If you don’t complain within a year, you need special circumstances and specific permission to proceed. Part of the delay had been occasioned by the police asking Fr Matt not to make their inquiries more difficult by potentially alerting the accused. In light of that seemingly reasonable explanation for delay, the five bishops could have waived their immunity in the interests of that much vaunted ‘transparency and accountability’. But instead of founding a defence on the facts, each elected to avail himself of what victims call ‘a loophole’ in the legislation, and duly wrote to the President of Tribunals objecting to the ‘one year rule’ being extended. This has become routine clergy practice on safeguarding complaints. Only one case was found to meet the legal test to proceed out of time, that being against the bishop who was made aware of the sexual abuse at the time over 30 years ago. However, the President of Tribunals ruled that as the only two potential witnesses to sustain Fr Matt’s complaint had since died – the Rev’d Trevor Devamanikkam and Fr Matt’s grandmother – the case came down to one person’s word against another’s, and the basic principle “he who asserts must prove” led inevitably to a dismissal of the case. This is all the more reason why the cafe incident gave Fr Matt – and many victims who identify with his struggle against the institution’s procedures – cause for modest hope. Here was a very simple case, independently attested, within time, which would surely break the unwritten but nevertheless iron rule that bishops never have findings upheld against them. Notwithstanding the simplicity of issues, and the fact that victims always have a problem with time limits pleaded against them, the Church of England itself missed steps in the procedural timetable on numerous occasions. And what is the penalty for that? Nothing. Bring your case a day late, and you have a struggle, but if the church fails to respond as required by its own legislation, there is no penalty at all. The only course open would have been to make a complaint under the Clergy Discipline Measure against the Archbishop of Canterbury, who was dealing with the matter, for failing to adhere to the time limits stipulated in the Measure. 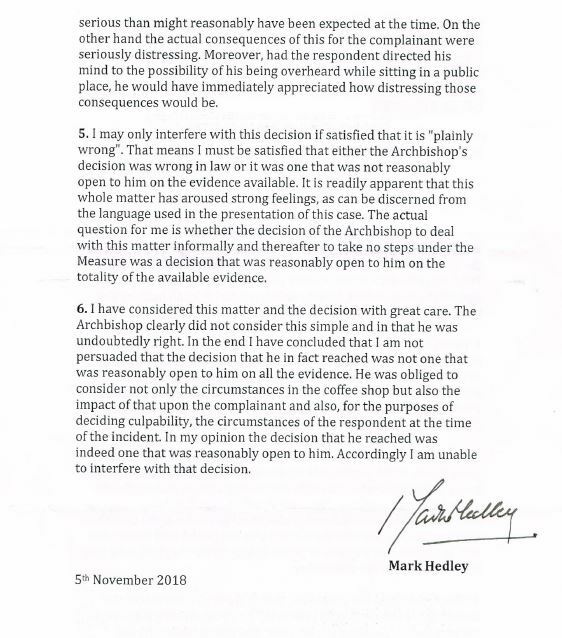 However, if Fr Matt had done that, he would have had to send it to the Archbishop of York, who just happens to be one of the five bishops who ignored his disclosures and wrote to object to the extending of the one year rule in the original case. This is a formal judgement in the public domain. Like every other legal decision, we can and should examine it for its impact and implications. What are we to make of this latest chapter of Fr Matt’s quest for institutional justice and an apology? At present, we don’t have any indications as to what changes the church has in mind, or even who is to be trusted to shape this renewed system given that the Archbishop has himself abused the system. How much outside input will be involved, and will it include folk like Fr Matthew Ineson? When will we have proposals for reform? Archbishop Justin was also reported as saying: “The Synod is capable of moving quickly when it needs to and when it wants to, but you have to prepare the ground.” Will Synod be asked so to act this February, with a full briefing, fully identifying the problems in cases such as this? Maybe we could have small-group work examining this matter as a case study. Perhaps this article will be accepted as a necessary part of “preparing the ground”. The present structure and implementation is unfair to everyone. Everyone in this story will have been good people with human kindness, great talents, a shared faith. I am sure that if they had been unjust to another child of God in any other context, their gifts would have been left at the altar, and they would have hurried to make their peace, but something horrible happens when they get embroiled in this broken, heartless structure. Fr Matt is deprived of any tangible meaningful outcome – not a single substantial apology from any of the bishops or the church institutionally. Hard as it may be, we should repent that the accused Trevor Devamanikkam slipped through the pastoral net and killed himself. Often abusers have their own demons. Fr Matt explains that the Bishop of Doncaster sought to mitigate his misjudgment by referencing stresses on himself, including blaming Fr Matt for waiving his anonymity and the story becoming public, and moreover, inter alia blaming the Archbishops of Canterbury and York who, he explained, gave him no support over the Bishop Philip North/Sheffield affair which was current and stressful at the time. When part of the mitigation touches lack of institutional support for the Bishop himself, it highlights the structural absurdities we currently endure: matters for which institutionally both Archbishops bear ultimate responsibility are evaluated by the very Archbishop who has to bring his own alleged failures into account when evaluating that mitigation. How does that work? Rather, more specifically, how does that work fairly for anyone? Plainly, a system riven with such perceived and potential conflicts of interests really is not fit for purpose, as Archbishop Justin has already identified. I am sure he is not comfortable with cases such as this. It is out of time (again) for Fr Matt to raise this, and he is somewhat weary of the role which our procedures place on him as a latter-day Javert, endlessly and implacably demanding that the law be enforced. It is a burden he does not want and should not have placed upon him. No victim should. The Church should carry the responsibility for prosecuting justice in these cases. Every victim I talk to asks: “Why do I have to do all the work?” They receive no independent legal advice to help navigate through a complex structure which even I, as a former lawyer, find difficult to comprehend. Nobody who has talked to Fr Matt can fail to be touched by his sympathy for others in distress, though understandably his empathy evaporates the higher up the chain of command one goes. The House of Bishops are the initiators of change. We shall soon learn, with the publication of the next General Synod agenda, how much urgency they have injected into the Archbishop od Canterbury’s remarks about the need for CDM reform and the speed that Synod can act – when or of it wants to. Having said that, one can have a degree of sympathy for Archbishop Justin. He has massive and varied responsibilities: he is trying simultaneously to hold his Province and the Anglican Communion together whilst also evaluating how to handle episcopal gossip in a Rotherham cafe. It is too much for any one man, made worse by having to operate a system and legal code in which he himself has no confidence. If there is “conduct unbecoming or inappropriate in the office and work of a clerk in holy orders”, the options available in a case which may not be a ‘hanging offence’ are limited, and of these I can, as a lawyer, understand why “No further action” appeals in a case of this kind. If a reasonable judge could reach that decision, it cannot be interfered with by the Deputy President. There is logic in this. If every reasonable decision is appealable, everyone would appeal. Yet surely if the President and his Deputy never interfere, then it is very hard to see how justice can ever be forthcoming. What is missing in all this is the option of an ‘Admonishment’. By that, I mean that the Church of England does not currently accompany a ‘no action’ outcome with a plain unequivocal finding that ‘this was wrong’. Vindicating the victims complaint is immensely important to them, regardless of the sequelae. Surely we need such an option in a revised system, preferably published and accompanied by a victim impact statement, and perhaps even an agreed statement of reconciliation in which the wrongdoer can offer an acknowledgement of error and a proper apology and, if possible an (entirely voluntary) acceptance. Closure on such a basis might be attainable with all parties able to move forward. As it is, the Bishop is untouched, the Deputy President emerges as a humane judge constrained by an insufficient legal structure, and the role of the Chaplain has slipped under the radar. The Archbishop has been affirmed in his procedural propriety and judgment, and does not have the embarrassment of having to find against his fellow Bishop. Everyone within the church wins. The only one… the only one for whom the whole prolonged process has offered nothing whatsoever is the poor victim, who has received no justice, no closure, and no apology whatsoever from anyone involved. On what basis do we in the Church suggest that this kind of outcome is anything other than a disgrace? 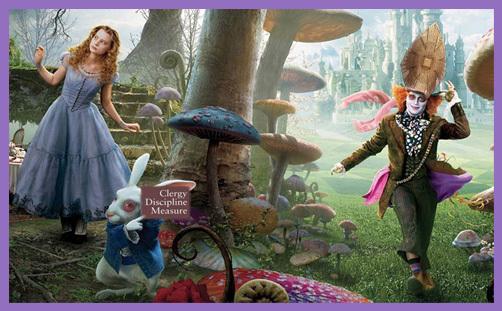 Talk to victims and they speak of an Alice in Wonderland world where injustice is justice, and due process means just what the church says it means: episcopal clothing is metaphorically rent, yet no apology escapes their lips. No wonder that victims increasingly advise each other not to disappear down this particular rabbit hole.